Hyundai is currently the second largest automobile company in India, where it has tasted the success with its sleek sedan Hyundai Verna. This car has the fluidic body structure, which makes it look like a lustrous vehicle. 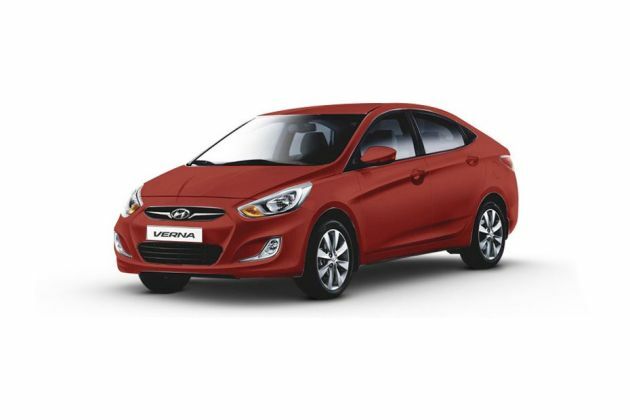 The company is selling this particular model with petrol and diesel engine options among which, the Hyundai Verna Fluidic SX CRDi AT is one of the top end variant. The South Korean automobile company has fitted this particular variant with a 1.6-litre CRDi diesel mill, which can produce the impressive mileage figures of about 19.08 Kmpl. The company fitted this engine with a 4-speed automatic transmission gearbox, which will further enhance the overall driving experience. This particular model comes with a classy interior cabin with plush environment and with great leg and shoulder space. This will help the occupants to enjoy a luxurious driving experience like never before. There are lots of comfort features incorporated to this vehicle that would pay complete value for the money. On the other hand, this top end variant comes with some of the sophisticated safety and protective aspects including disc brakes with ABS and EBD, air bags, impact sensing auto door unlock and several others. The Hyundai Verna Fluidic 1.6 CRDi SX AT trim is one of the top end variants in its model series. This particular trim has a modern body design because of its fluidic structure. This sedan comes with a groundbreaking body style that mesmerized many of the auto enthusiasts in the country. One can notice the expressive lines all over its body line that makes it look like a next generation sedan. To start with the front profile, there is a hexagonal design radiator grille that is decorated with the chrome plated strip and a prominent company logo. This grille is surrounded by the sleek and curvy headlight cluster that comes integrated with powerful halogen lamps and turn indicators . The front bumper is looks very sporty and it is designed with built in fog lights and a wide air dam. When it comes to the side profile, there is an expressive line on the doors that passes all the way from fog lights to the taillight cluster. Here the wheel arches have been fitted with the 16 inch alloy wheels, while the doors are assembled with body colored handles and ORVMs. The side profile is further amplified with the indicator blinkers on ORVMs, which will also improve the safety. Coming to the rear, you can notice the bumper has a very smooth surface and has been painted in body color. The boot lid has an arch sort of design and it is accompanied with chrome plated badges. Coming to the interiors, this Hyundai Verna Fluidic 1.6 CRDI SX AT trim has the best in class interior cabin with eye-catching design. One should step inside the vehicle to experience the plush environment of the cabin by availing lavish comforts. In the front cabin, the dashboard comes with an eye-catching design and a very stylish central console. This central console is being fitted with several advanced equipments such as music system, AC unit along with vents. There is a high gloss black and wood grain finish on this console as well as on door panels. The steering wheel inside the cabin gets the chrome and silver inserts and it is mounted with audio and Bluetooth call connectivity buttons. This particular variant's interior comes with a dual tone beige and black color scheme, which is further accentuated with chrome inserts and Blue interior illumination. Here the door handles, gear shift knob and steering wheel gets the chrome inserts, which will add to the elegance of interiors. There are several useful functions incorporated inside the car such as a glove box compartment, 12V power outlet , bottle holders, cup holders and so on. The company powered this particular trim with a 4-cylinder, DOHC based 1.6-litre CRDi diesel power plant that can produce 1582cc displacement capacity. This engine comes incorporated with common rail direct injection system that enables it to produce immense power like no other engine. The power produced by this engine is about 126.3bhp at 4000rpm while yielding a peak torque output of about 259.9Nm in between 1900 to 2750rpm. The company paired this engine with a 4-speed automatic transmission gearbox that distributes the power to the front wheels and returns an impressive mileage of about 19 Kmpl. The South Korean automaker is offering this sedan with a proficient braking and robust handling mechanism. This trim is blessed with disc brakes, fitted to all its four wheels. This reliable braking mechanism is enhanced with an anti lock braking system along with an electronic brake force distribution system . Coming to the handling aspects, this top end variant is incorporated with a highly advanced electric power steering system that makes the steering easy. When it comes to the comfort features, the Hyundai Verna Fluidic 1.6 CRDi SX AT trim is being offered several exciting comfort and convenience features. One of the most important comfort feature is the automatic air conditioning system that comes with a cluster ionizer, which will keep the cabin pleasant and hygienic with clean air. The company equipped this top end variant with a set of features including a key less entry system, reverse parking sensor, rear view camera with display on ECM, an advanced driver information system, electrically adjustable and foldable ORVMs, Bluetooth connectivity with steering mounted call controls, a supervision cluster, and several other exciting features. Apart from these, Hyundai is also offering features such as a front map lamp, theater dimming interior lights, height adjustable front seat belts, MT shift indicator , driver and passenger vanity mirror and an advanced 2-DIN music player with USB and AUX-In connectivity sockets. This top end variant is bestowed with quite a few standard safety functions. Some of those features include an immobilizer system, ABS with EBD, central locking system, air bags (dual front, side and curtain), clutch lock system , and so on. Also there is an impact sensing auto door lock system that will enhance the level of safety inside this variant. Pros: Luxurious interiors, incredible engine performance. Cons: Safety features needs to improve, price is very high.